You know how Discovery Channel does "Shark Week" each year? I'm doing something similar. Everything this week will be about fungi...you know, mushrooms. Don't worry, these mushrooms won't attack you but you might attack them! Humans have been eating mushrooms ever since pizza was invented. Okay, that might not be factual. But we have been cultivating them since the Chinese were growing them in oak logs in the 13th century (McGee 9440). If we were growing them then, we were probably eating them long before that. Maybe lightning struck a dinosaur and while the cavemen were enjoying the overgrown lizard's unfortunate demise, they noticed some nearby fungi smoldering in the embers and how great they tasted together. The white mushrooms that you find in almost any grocery store produce department began to be cultivated in the 17th century in rock quarry tunnels near Paris (McGee 9440). To me, what is more important is the recent history. When I first worked in a stupidmarket produce department in high school (circa paleolithic era aka "1985"), we had two kinds of mushrooms for sale. the reduced price ones that were the same packages but almost out of date and turning brown. 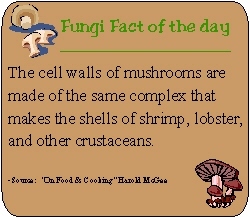 These days most grocery stores stock fresh white, portobello, and shiitake mushrooms and other dried varieties. With the farm to plate movement, many areas local purveyors of specialty mushrooms with unique textures and flavors. Many folks like Larry of Big Dude's Eclectic Ramblings have bought kits and are growing their own. Places like local Brewer's Mushrooms will set you up and educate you to grow your own specialty mushrooms easily, at home and using no chemicals other than H2O. I stumbled on Brewer's Mushrooms at a local market last year. When they were making deliveries in town this week, Hugh dropped by an unexpected surprise of a variety of fresh mushrooms AND a lions mane grow kit! That inspired Fungus Among Us Week. I won the custom cutting board & a year of coal from a cooking contest with McCormick's last year. 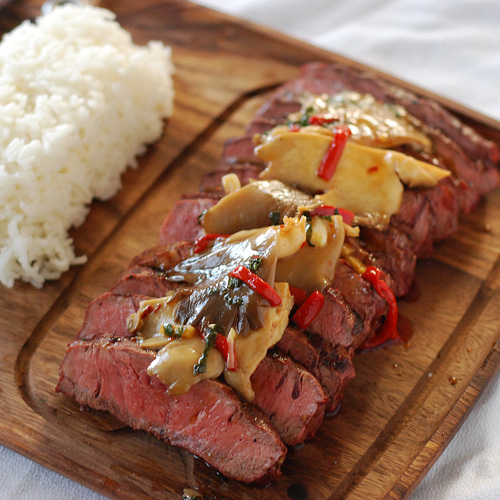 This grilled steak combines the "fifth taste" of umami from the oyster mushrooms* with layers of ginger, garlic, basil and red chilies to create an Asian flavor profile that hits all notes of the taste buds. The stir fry cooks during the steak's resting time, making it convenient for a quick but delicious dinner. Preheat a charcoal grill to 450f set up for direct heat. 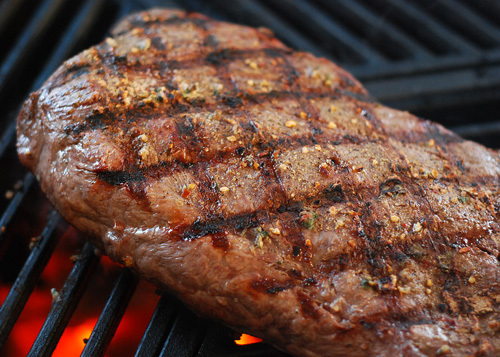 Grill the steak 5 minutes per side, or until it reaches an internal temperature of 130f for medium rare*. Remove steak and rest on a raised rack. Drizzle the sesame and peanut oil into the hot wok. Stir fry the mushrooms for 3 minutes until starting to turn tender and releasing their moisture*. Add the garlic and ginger, stir fry another minute. Add the basil, beef stock, mirin, soy sauce, and red pepper flake. Stir fry another 1-2 minutes. Add the slurry and cook another minute or until the sauce is thickened. 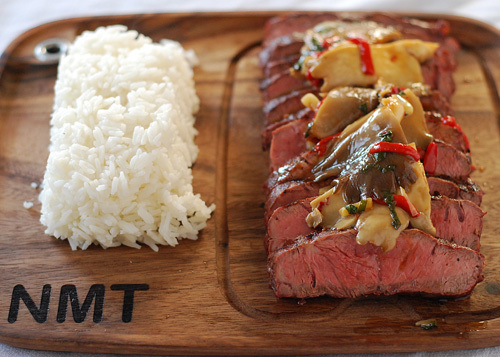 Slice the steak across the grain (short side) and serve family style with the mushroom stir fry over the top. 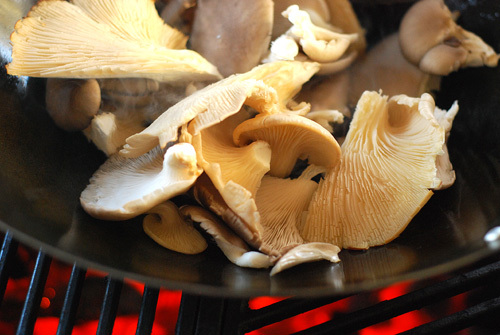 Oyster mushrooms have a natural umami flavor. 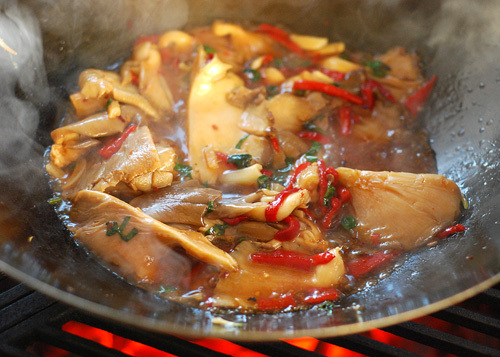 If you can't find oyster mushrooms, use another kind and add 3/4 tsp fish sauce to the mirin/soy sauce mixture. For the Big Green Egg, I had the top DMFT totally open and after preheating, the bottom vent was about half way closed. For the Big Green Egg, I closed the bottom vent all the way. The fire was already going from the steak and stir frying requires you to have the Egg top open. The coals will get plenty of air from the open top. I love the flavor of sesame oil but using it as the only oil is over powering. Using a little sesame oil with a neutral flavored oil like peanut oil gives a balanced flavor. The combination of coarse rub ingredients like garlic, pepper flake and basil add texture. Fresh mushrooms "stir fired" over hot coals seem to cook quicker than stir fried on a stove. Saucy, rich, spicy, and mushroomy! Served family style. Trick - stuff the rice into a mini loaf pan and invert it. This series was written in conjunction with Brewer's Mushrooms. It is a joint project with a local expert and is not a paid advertisement. 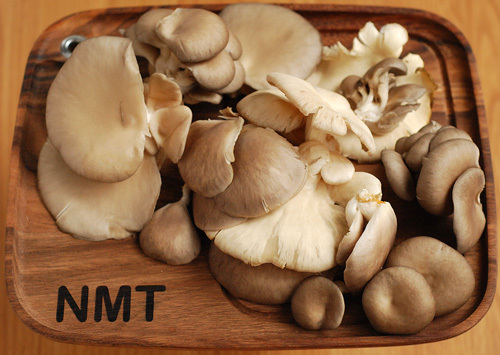 Hugh Brewer is trained in mycorestoration and Brewer's Mushrooms has been specializing in fresh gourmet mushrooms for years. Brewer's Mushrooms offers fresh mushrooms at local markets, CSA shares, grow kits, and workshops.